Silver plated medallions sold on BoB as 0.999 Silver!!! When going through some of my silver coin/medallion accumulation the other day I came across some Krugerrand “Silver” Medallions that were sold as 0.999 Silver and on double checking the mass and dimensions etc I came to the conclusion these purchases were silver plated fakes! A quick check on Google confirmed my suspicions. I have contacted the BoB seller by e mail and still await a response. At one stage on BoB I had engaged my buying brain instead of my analytical brain….silly me!!!! Silver bars are now my target.. I have thousands of silver coins - largely crowns and Rands for easy trade. Medallions are a grey area - and as you state it is easy to come unstuck. A year ago I predicted the old 5/- selling for R500 and now that is what a lot of sellers are getting. 18 months ago I picked up hundreds of silver Union South African crowns on BoB for R70 each. In a year I predict the South African silver crown will sell on BoB for R1,000 as the price of PHYSICAL silver and gold goes ballistic. 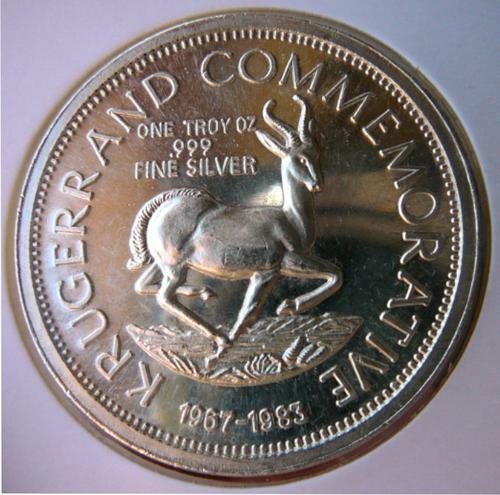 If you are not buying silver bars from a recognised authority like the Perth Mint or genuine South African coins with a known silver % or authenticated silver medallions - BEWARE!! I now have over 200kg of PHYSICAL silver in bars, coin, silverware and other stuff - and take absolutely no interest in the manipulated PAPER (Wall Street) price - apart from having a good laugh!! I love the fact that people actually believe the price of silver is under US$30 per ounce.. I am an eager buyer knowing the truth is very, very different. Where can I get hold of a list where I can find the value of old silver coins. My hubby knows an old black man who wants to sell his coins but want to see what i'ts worth before doing so. Can anyone help me with it? This old man seems to have a whole bag full of the old coins! I think its better to get the old coins rather than bars. Don't get me wrong bars still has their place BUT if the SHTF scenario happens one will need smaller pieces of silver to pay for goods. You cant just break a 1kg bar into 50x smaller chunks to pay for whatever you need. Get the coins I say as they are already minted in set weights and can be used to barter. Either way investing in metals is the way to go now. I would say spread the portfolio as higher weight bars are cheaper per once. But using a 1kg bar to bay for an item worth 100g might have some issues with the change needed. Thread hijackers will be fined one hundred ounces of silver per occurrence...bullion only please....my courier will collect!!!! I agree and have thousands of silver tickeys, sixpences as well as the crowns. I have the bars for more substantial purchases like land. What is the process to make an official complaint to BoB re this issue. I am not the only BoB Buyer to purchase these fakes??? Please report this to communitywatch@bidorbuy.co.za and please also get confirmation from Gold Reef City Mint who minted the medallions (if it's these medallions that are being sold in this manner). Please send all details and any documentation confirming this to us. I tried to add a picture but too many characters!!!! Is this the "Coin" from The Gold Reef City Mint???? Yes, it appears so. GRC Mint did mint a fine silver 1oz medallion. They also have their own token coins.. which were once used in the shops at Gold Reef City in the 1990s. Then this was not the "silver" medallions purchased on BoB...refer to the above link to the picture I posted! I can't find this purchase, do you have an idea of when it was purchased? I hope this helps....thank you. Thanks. Can you get confirmation of this from a reputable dealer? Let me see what I can do..when I can find the time......just had a rush of business orders!!! Thanks, useful link but we do require confirmation from a reputable dealer. 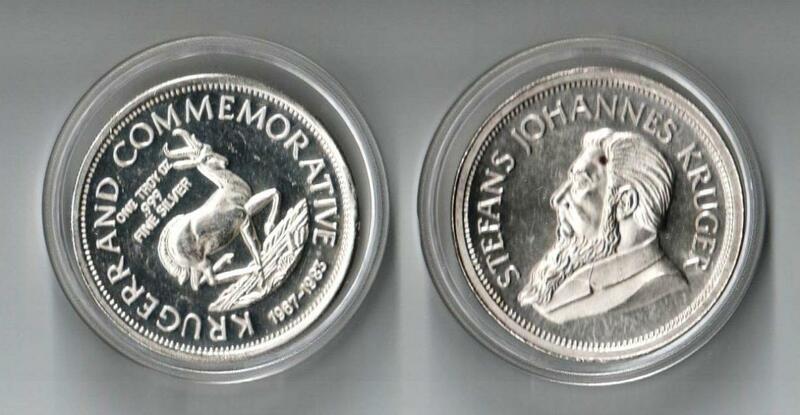 Please note, these coins are actually not permitted to be sold on the site, and are in contravention of the SARB Act. We have removed a few already but if you see any please feel free to report them to communitywatch@bidorbuy.co.za. These Medallions are minted as per American coins...."head to toe". 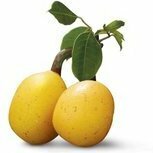 Last time I looked the "gold" miniatures were still being sold....whether real or fakes no idea!! !